Thermaltake Technology participates at the CES 2017 held at the Venetian Hotel Titian 2303 Suite from January 5th (Thu) to 8th (Sun) and introduces new products. First off, Thermaltake unveils its new RGB-lighted power supply series at CES 2017 – the ToughPower Grand RGB Gold and Smart Pro RGB Bronze series power supplies. Thermaltake also introduces the world’s first pure black coolant at CES 2017, the C1000 Opaque Coolant Black. Thermaltake also introduces two new case models, the Core P1 TG Mini ITX and Tower 900 E-ATX cases. Thermaltake Technology participates at the CES 2017 held at the Venetian Hotel Titian 2303 Suite from January 5th (Thu) to 8th (Sun). 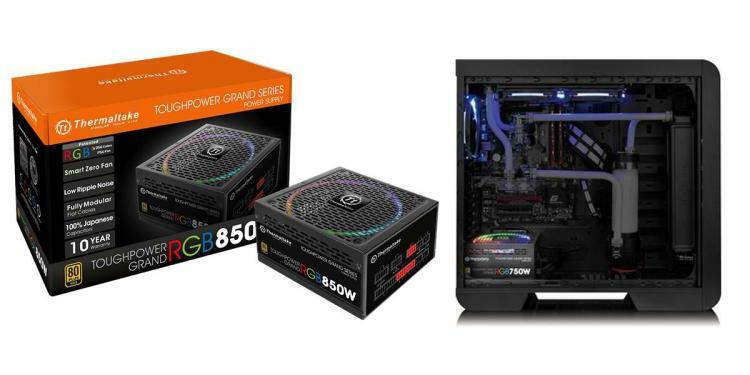 The two new power supply series from Thermaltake feature high-quality components and RGB lighting with patented 256 colors coming from the Riing 14 RGB fan cooling the unit. The Riing 14 RGB fan offers five lighting modes - 256 Color RGB Cycle, Solid Red, Green, Blue, White, and a LED Off mode. The Toughpower Grand RGB Gold Series carries a 10-year warranty, and the Smart Pro RGB Bronze Series comes with 7-year warranty coverage. What the Thermaltake Toughpower Grand RGB Gold Series introduction video below. 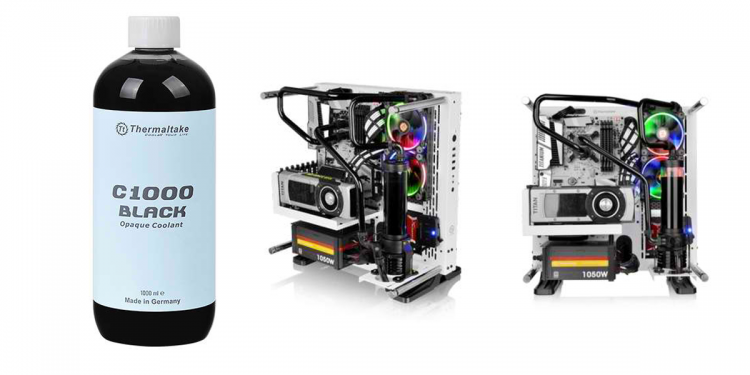 The Thermaltake C1000 Opaque Coolant Black is the world’s first ever pure black coolant that’s made in Germany, virtually odorless, non-flammable, fully biodegradable, excellent cooling performance and easy bottle filler design. 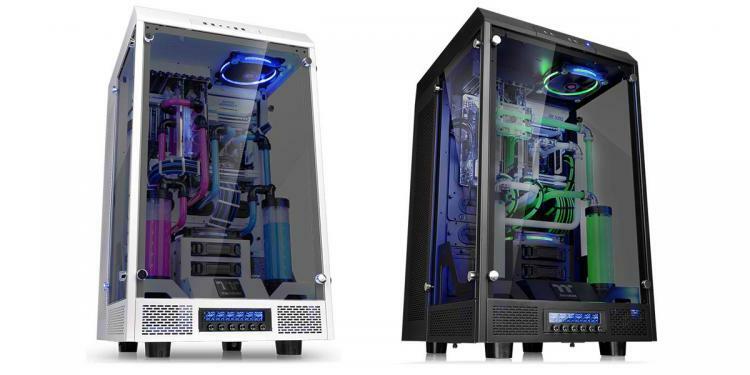 Thermaltake will be launching its first TT Premium modder edition chassis series – The Tower 900 E-ATX Vertical Super Tower Chassis and The Tower 900 Snow Edition E-ATX Vertical Super Tower Chassis in black and snow colors. 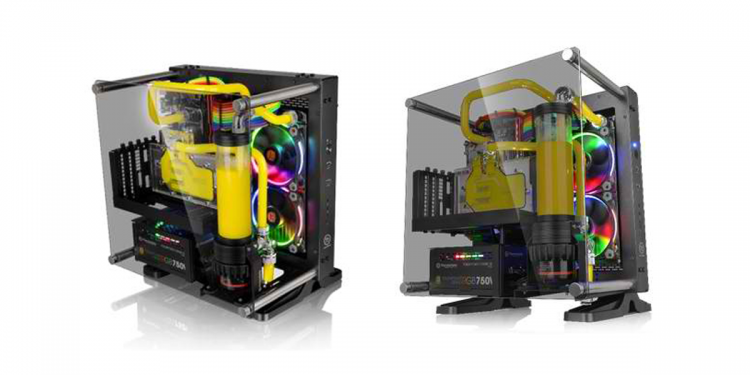 The Tower 900 was created in partnership with Watermod France. The Thermaltake Tower 900 Series features a vertical mounting design, high quality 5mm thick tempered glass panels, and unrivaled expansion capabilities for massive custom liquid cooling systems. Thermaltake expands its Core P Series by adding the Core P1 TG Mini ITX wall-mount, tempered-glass chassis to the lineup. The Core P1 is simply the ITX version of the larger Core P5. The Core P1 is also a wall-mountable case which includes a riser cable for users to build the system the way they want. The Core P1 also features a 5mm thick tempered glass panel like the P5. For storage, it has 1 + 3 drive bays with modular trays design and two USB 3.0 ports; plus it also accommodates two 120mm or 140mm fans on the left side and up to a single 280mm radiator. Further information from Thermaltake at CES 2017 is available on the dedicated Thermaltake CES 2017 website.